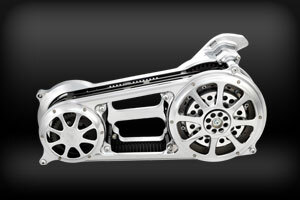 Performance Machine motorcycle parts are top of the line. 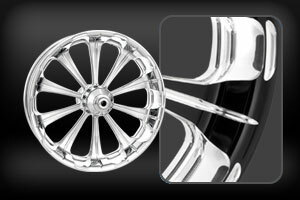 Forged wheels, brake systems, accessories, controls and more. Bikes Built Better starts with parts and accessories manufactured better. 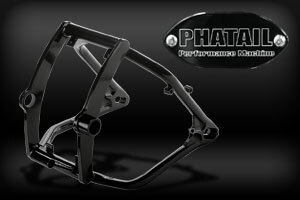 When it comes to quality motorcycle parts Performance Machine motorcycle parts are top of the line. There is more to each and every part than a design sculpted from aluminum. 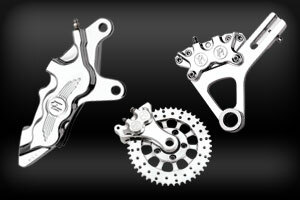 PM products are pieces of art for your motorcycle that help create your unique ride. Each PM product becomes a form of self-expression when it's installed on your bike. Whether you are building your dream one piece at a time or all at once, PM products are designed to help you create a cohesive, custom look with timeless beauty that lasts. 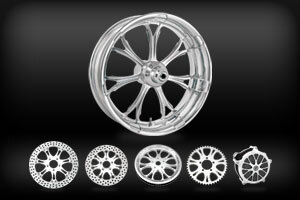 This high-end collection of wheels includes two designs to start the product launch - the REVEL and VIRTUE. Take a good look at the design and you'll notice there's a whole new dimension in these billet beauties. 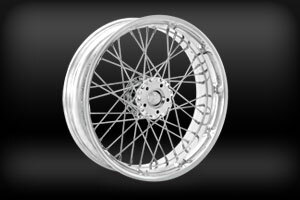 Performance Machine Forged Aluminum wheels are the finest wheels in the motorcycle market today. Innovative and stylish, PM wheels are manufactured in the USA to ensure quality and performance. Performance Machine creates some of the most impressionable Spoke Wheels in the motorcycle market place. Two cool spoke wheel designs available now for Harley Davidsons & V-Twins. Performance Machine's Air Cleaners and Intake Systems are CNC-machined from billet aluminum and feature internal crankcase breather system and high-performance K&N Air Filter. Increased horsepower without sacrificing style. 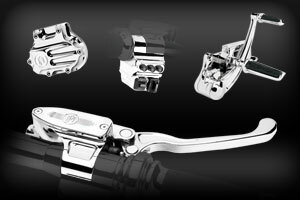 Performance Machine motorcycle accessories provide the finishing touches for any motorcycle with PM's unique styling. PM quality built into every product so customizing is simple and straightforward. Performance Machine brake systems have set the standards in the industry for braking. Style and function merge for an ultra clean look with proven differential bore technology for optimal brake performance. Performance Machine Hand and Foot Controls were designed to give you the ultimate in riding pleasure. With an unmatched look and feel, PM Controls are engineered for optimal braking performance with little effort at the lever. The chrome version now features the same machined, open windows as the Contrast Cut. Superior performance with improved styling for your machine. Open face style for Softail and Dyna applications. Performance Machine is known world-wide for it's premium motorcycle forged wheels, brakes and accessories. PM offers the same quality products for Harley Davidson and American V-Twin trikes. 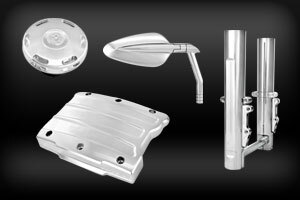 The PM Phatail kit is a BOLT-ON Kit for 1991 and newer Softails that allows our 18" x 8.5" wheel to rest comfortably in the confines of a bone stock HD Softail frame! Includes swingarm, fender, billet struts, all necessary transmission parts. Inspired by the popularity of high performance urban style metric motorcycles, PM continues to refine their proven forged aluminum wheels for the needs of the modern sportbike. Performance Machine motorcycle parts are designed for going, not just for showing! Find the most popular replacement parts for PM products. 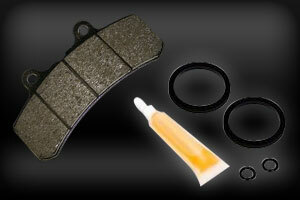 Rebuild Kits, Brake Pads, Anti-Rattle Springs, Caliper Shim Kits, Anchor Rods & Ball Rod Ends and more. 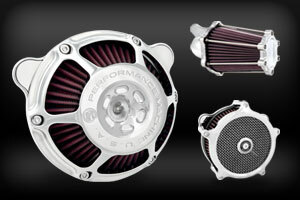 Performance Machine motorcycle parts are top of the line. 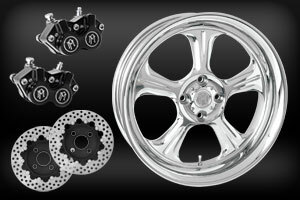 Forged wheels, brake systems, accessories, controls and more. PM products are pieces of art for your motorcycle that help create your unique ride.